(Caribbean Tourism Organisation Press Release) – Bryanna Hylton, the Westwood High School, Jamaica student who won this year’s Caribbean Tourism Organizstion (CTO) Tourism Youth Congress, will join the CTO’s programme of activities for Caribbean Tourism Month (CTM) which is observed during the month of November. The remainder of the panel includes the CTO’s secretary general, Hugh Riley; Antigua and Barbuda’s ambassador to Ethiopia and member of the Caribbean Community’s commission on marijuana L. Franklin “Ras Franki” Francis; Jerry Rappaport, the president of the Grenada Hotel and Tourism Association; Canadian journalist Adrian Brijbassi and Barbadian pollster Peter Wickham. The hour-long discussion, which begins at 11:00 a.m. Eastern Caribbean Time (11:00 a.m. in New York, 10:00 a.m. in Jamaica and 3:00 p.m. in London), can be viewed on the CTO’s Facebook page, www.facebook.com/CaribbeanTourismOrganisation/. 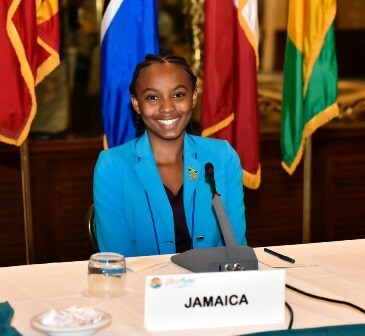 Hylton was one of a record 18 secondary school students who participated in the Youth Congress at the State of the Tourism Industry Conference in The Bahamas earlier this month. Her presentations focused on designing and creating a new wellness and rejuvenation tourism product or service offering, which has a Caribbean flair, feel and/or touch. She emerged winner ahead of St. Maarten’s Kiara Meyers, who placed second, and Caroline Pain of Martinique, who was third. The Caribbean Tourism Organisation (CTO), with headquarters in Barbados, offices in New York and London and representation in Canada, is the Caribbean’s tourism development agency comprising membership of the region’s finest countries and territories including Dutch, English, French and Spanish, as well as a myriad of private sector allied members. The CTO’s vision is to position the Caribbean as the most desirable, year round, warm weather destination, and its purpose is Leading Sustainable Tourism – One Sea, One Voice, One Caribbean.